If you’re building a new home or refinancing, the economics are even more attractive. Including the price of a solar water heater in a new 30-year mortgage usually amounts to between $13 and $20 per month. The federal income tax deduction for mortgage interest attributable to the solar system reduces that by about $3–$5 per month. So if your fuel savings are more than $15 per month, the solar investment is profitable immediately. On a monthly basis, you’re saving more than you’re paying. Use the solar energy factor (SEF) and solar fraction(SF) to determine a solar water heater’s energy efficiency. Don’t choose a solar water heating system based solely on its energy efficiency. 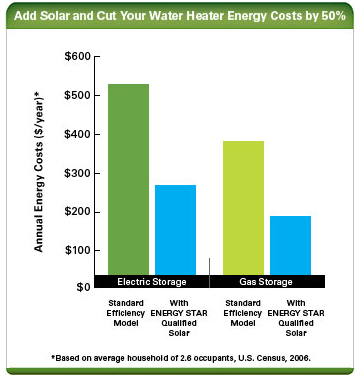 When selecting a solar water heater, it’s also important to consider size and overall cost. Heat Exchangers for Solar Water Heating Systems Which Water Heater Is Right for You?